Discussion around the bestseller The Benedict Option by Rod Dreher has led many people to want to know more about monastic principles. 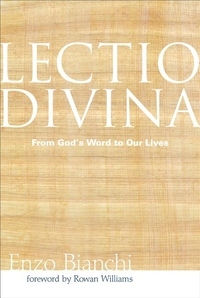 This book by the modern monastic prior Enzo Bianchi (of the Bose Community in Switzerland) explores lectio divia, which is a principle practiced in many monastic houses today. The Bible is ancient, enigmatic, and from a culture vastly different from our own. That's why most of us find it hard to read. So how can we understand its importance in the church, and how can it enrich our lives? Central to lectio divina is the conviction that to read the Bible faithfully and prayerfully is to learn an ancient art - by entering into dialogue with the God who speaks to each of us through the biblical page. Enzo Bianchi touches on the essentials of the history of lectio, from the brilliant thinker Origen in the third century to the development of historical criticism in the modern era. He explains how to do lectio and how to understand and implement its four "moments" - lectio, meditatio, oratio, contemplatio. This is not simply a book about how to approach the Bible, because Scripture ultimately wants to lead us beyond itself, to the truth and mystery of Christ that can never be captured fully in the written word.